In about 1974 I made friends with a girl in my older sister's class. Her name was Lois Lew and we were nerds together until I moved to Munich at the end of 1975. She only had one sister while I had 3 sisters, 2 brothers and a cousin, so we always hung out at her house. We spent hours playing Rummy 500 and listening to Alan Sherman records while eating crackers with peanut butter. I told you... nerds. What does this have to do with Disney's new movie, John Carter of Mars? It was Lois who handed me Tarzan of the Apes and said, "read this!" I did. Then I read the next and the next until I had raced through the 20+ novels in the Tarzan series. After rereading them a few times, Lois suggested I read the rest of Edgar Rice Burroughs' books. Which is how I came to read A Princess of Mars. ERB's books are full of impossibly strong, agile and chivalrous men and beautiful, intelligent women. I loved every one of them. Tarzan would always be my favorite, but John Carter was a charmer and Mars was a fun place to visit. 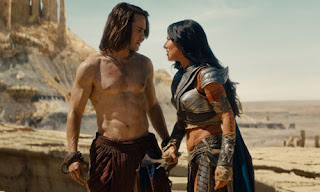 No one has ever made a decent Tarzan movie, but - finally - someone has made a great ERB movie in John Carter of Mars. The Disney movie sticks loosely (very loosely) to the mythology and storyline of the original books. Where they really get it right is in the heart of the characters and world. In this version, John Carter encounters a stranger in a cave who tries to kill him. After shooting him in self defense, Carter bends to hear the stranger's dying words. As he does, he grasps a medallion in the man's hand and is transported to a a dusty plain. He discovers that he can jump great distances and has superhuman strength. Soon he encounters giant green beings with four arms and gets embroiled against his will in a war in defense of the princess, Dejah Thoris. John Carter is played by the hunk from Friday Night Lights while Dejah is someone new to me. They fit the roles perfectly. The CGI was incredible, especially with the alien races. Disney made the technology very steampunk, not my favorite, but it worked here. Of course I loved the dog-like creature, he reminded me of Scooter. I get why the critics didn't love it, but this kind of movie isn't made for critics. It's made for geeks/nerds like me and my mom and Lois, wherever she is. I hope it brings new fans to the original novels. I just hope that someone, someday, does as good a job with Tarzan as they did with John Carter. If they do, I'll be there.